Ailing and aging, Sen. Edward M. Kennedy issued a ringing summons to fellow Democrats to rally behind Barack Obama's pioneering quest for the White House Monday night in a poignant opening to a party convention in search of unity for the fall campaign. Democrats opened their four-day convention in the shadow of the Rocky Mountains as polls underscored the closeness of the race with Republican John McCain. And there was no underestimating the challenges confronting Obama, although he moved to head off a divisive roll call later in the week. Under an emerging agreement with Hillary Rodham Clinton, it appeared likely both their names would be placed in nomination, and the former first lady would eventually call for his nomination by acclamation. Besides lingering bad feelings from the Democratic primaries, Obama also faces alternately mocking and searing attack ads from McCain and his Republican allies, and a reminder that racism, too, could play a role. "There are people who are not going to vote for him because he's black," said James Hoffa, president of the Teamsters union. "And we've got to hope that we can educate people to put aside their racism and to put their own interests No. 1." He spoke in an Associated Press interview. Kennedy and Obama's wife were the bookends of an evening that left the delegates cheering, one representing the party's past, the other its present. Obama's wife, eager to counter a Republican claim that her husband is an elitist, said his story is classically American, his family one that scrimped and saved "so he could have opportunities they never had themselves." Obama was largely raised by grandparents after his parents, a white woman from Kansas and a black man from Kenya, divorced. Among his values, she said: "that you work hard for what you want in life, that your word is your bond and you do what you say you're going to do, that you treat people with dignity and respect, even if you don't know them, and even if you don't agree with them." The convention's opening gavel fell with Obama and Clinton still struggling to work out the choreography for the formal roll call of the states that will make him the party nominee. 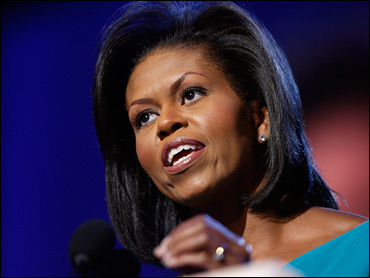 Michelle Obama included a tribute to her husband's former rival, crediting her with having placed "18 million cracks in the glass ceiling" that constrains women's ambitions. "There is no doubt in anyone's mind that this is Barack Obama's convention," Clinton told reporters early in the day. And yet, she said, some of her delegates "feel an obligation to the people who sent them here" and would vote for her. Kennedy's speech was an implicit appeal to her delegates - and the 18 million voters who supported her in the primaries - to swing behind Obama. He said the country can meet its challenges with Obama as president. "Yes we can, yes we will," he said, echoing Obama's own signature refrain. "This is one of those great moments in political history," said CBS News chief Washington correspondent Bob Schieffer, referring to how Kennedy's press secretary last night still didn't know whether Kennedy could make it into the hall, much less to speak. "You know there is nothing quite like the Kennedy name to light up any Democratic gathering… It was a moment that these delegates will never forget." Howard Dean, the party chairman, rapped the opening gavel precisely on schedule at 3 p.m. Mountain Time - before only a smattering of delegates.